Below is some verbiage from church signs that comes specifically dis-, un-, non-, and in all other ways NOT recommended. If a church is trying to proselyte members from other churches where the worship part of things presumably isn’t as cool or exciting, shame on the proselytizing church. If a church is under the impression that backslidden believers might be influenced by worship-related signage to say to themselves, “Hey, yeah, I really should get back to church attendance,” it might consider that worship isn’t the heart language of many of the backslidden. If a church is trying to bring unbelievers in, it ought to be cognizant of the fact that outsiders aren’t thinking in terms of worship, either. Messages about worship aren’t very likely to attract the unchurched. Now, to seven non-wonders of this particular church sign revelation. . . .
I’m dozing already, and I haven’t gotten out from behind the wheel of my car yet. This kind of church sign seems passe to me now. 20 years ago, it was attractive — even fetchin’ — to use a label like this. These days, it just seems old hat and shallow. For starters, it conveys the false impression that victory is yours for the mere claiming. Or, worse — that if you follow Jesus, your life should be happy or else you must be doing something wrong. Yet more insidious is that a message like this tends to disenfranchise those who a) don’t feel like praising, b) don’t understand what praise is, c) have had their fill of churches who major in boisterous praise, d) don’t feel the need for a victory in their lives, e) have given up hope that “victory” can occur, etc. Before you take me to task for not giving credence to the notion of bona fide spiritual victory based on the atonement, pause to consider the actual, likely reason the word “victory” is on the sign. It’s not any deep reference to the Rider on the White Horse defeating the dragon; it’s likely just a feel-good, Osteenish thing. The letter spacing on this sign was so poor — and my orientation to Latin-derived vowels and the mention of Berea in Acts so strong — that I initially had no idea this sign was referring to the Corpus Christi Bay. I pronounced it aloud within the confines of our car, and “Bay” became “Bye,” so it rhymed with “diarrhea.” Whoops. I actually saw this on a changeable church sign, and I have witnesses. I’ve seen a lot in my time, but it is beyond my comprehension that anyone could consciously post this message unless s/he had a death wish for a presumably comatose church. It’s not that passers-by shouldn’t have their ways tested, and it’s not even that this church didn’t have some healthy, well-founded judgment going for it. It’s that this is not a good idea to put on a sign. This one happens to have appeared on a regularly changing sign that I pass regularly. And I have observed that people in this church are pretty energetic and sincere, as a rule. I even met this church’s head pastor, and he impressed me with his character and manner. But “How To Be a Church Member?” If this is what we’re conceiving and advertising, it’s no wonder no one is interested. One thing that’s wrong with the institutional church is that it wants to convert people to it and not to Jesus. Key in on the reddish-black part in the middle of this sign. This is one of the more unremarkable of the many unremarkable signs in the church world. I mean, who is this message for? 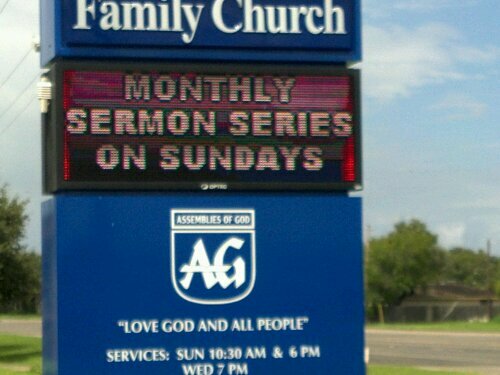 Leaving alone for a moment the questionable validity of the sermonic method, why exactly does a church — or, more aptly, a pastor — want to advertise that there is a monthly sermon series? Who does this information attract? Who does it even inform? The regular congregants are already aware of the series (and may be bored out of their minds). And no potential visitor is going to be attracted based on the sign. This digital sign indicates that a kind of myopic preoccupation with self, blind to the real world, is at work. Right! Next topic. . . .
A few days ago, I happened by a church building I hadn’t ever seen before. It looked well kept and reasonably up to date. Its sign said something like “Valley Christian Fellowship,” and I quickly thought maybe we’ll visit there soon. But then I saw that one more piece of information was given on the sign—the pastor’s name. Letting alone the biblical definition of “pastor” and the discrepancy between biblical precedent and the roles of most churches’ “pastors” today, I would like to express my disappointment in such signage. A hierarchical view of church leadership is not a very biblical one. And if there were to be a hierarchy, a single person should not be at the top. Such signs indicate a top-down hierarchy. I wrote about this once before, and it was suggested to me that outsiders need a point of contact, which is one reason a pastor’s name might be displayed. (Incidentally, I responded that the church secretary’s name is really the one that should be on the sign!) If we say to the world through our sign two things—1) that this is who we are, and 2) that this is our single leader, well, it sends a message, and it is a message I don’t believe God wants sent. I don’t think we’ll visit the Valley Christian Fellowship after all, and that’s a shame, because there could be some really good, God-honoring, Bible-following people there, and the “pastor” could in fact be very humble—a true leader who didn’t really want his name in lights. But the sign sent a message, and I am weary of encountering churches that send that message. And why would we NOT choose to put the preacher’s name on the sign? Even if you’re a traditionalist in this regard (read: you believe the preacher or pastor has God-given authority by virtue of his “call” [whatever that is, in your tradition], and/or you believe the church identity should be clearly tied to this one person), maybe you would think on this: if we don’t display the preacher’s name on the sign, it could signal a positive change toward a mutuality-based paradigm. FOOTNOTE: Yes, there is some (limited) biblical rationale for the authority of a single evangelist, but this model is not as commonly depicted in scripture as the model that has multiple shepherds/elders as spiritual leaders, with no person or group in authoritarian command. And beyond either of these models — that of the authority of a single evangelist or a group — the biblical vision of a one-another-based church is compelling. The second one seems a more apt signifier, doesn’t it? Doesn’t it advertise more clearly the thing that’s significant to those who see the sign? If I’m looking for my motel and I know it’s “America’s Best Value,” I could find it when I see the sign. Conversely, when one is looking for the Brandywine Nursing Home to visit great aunt Millie, she could easily pass over “Accord Health Services.” Who really cares that it’s Accord Health that runs the nursing home? That’s not what I need to see on the sign. What needs to be “signed” is the thing that people who see the sign need to know. The attention should be placed on the right thing, or entity, or person. In my way of thinking, it is highly inappropriate to name a church or church building after a human. “Johnson Memorial Baptist Church” and “Thomas E. and Margaret Weatherford Chapel” are spiritually bothersome, if not irreverent. (I don’t even like the naming rights guaranteed to large-scale donors at institutions of higher learning, but at least there’s no deity to upstage there.) “Methodist” or “Baptist” by themselves may be shades more apt than “Lutheran” or “Wesleyan,” but the hue is the same. It should be recalled that neither Luther nor Wesley wanted a denomination named after him. And, in my time, I haven’t known of Lutherans or Wesleyans bent on using those names with the purposes of dividing, but the effect of erecting walls still warrants mention. Denominating itself can be neutral, harmless … but it also can result in insidious divisiveness. Agreed — anything in the church universal, including naming rights, that takes honor from Jesus is to be avoided. It’s even possible to use His name divisively, as Paul mentioned in a letter to the Corinthian church (1 Cor. 1:12). In this context, Paul’s, Apollos’s, Cephas’s, and Jesus’ names were being used divisively. (And I got spirito-emotionally smacked around by my own church about 15 years ago for suggesting we were doing just that.) May we never be guilty of sectarian exclusiveness, and, on a more positive note, may we advertise to the world — in our signage and by our lives — precisely what Jesus would want broadcast.